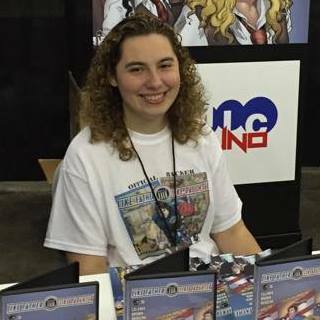 Our very own Kathryn Calamia (aka Comic Uno) finishes the first story arc of her very first comic book Like Father, Like Daughter! Join Casey Ryder as she learns more about her newfound superpowers and struggles to have a relationship with her father. I previously showcased the book in a special feature piece called “Like Father, Like Comic Uno” and did a Kickstart the Week(end) featuring the second issue. Casey dealt with her father abandoning her and her mother when she was young. He left them in to become the full-time superhero known to the world as Invulnerable. While the world around her loves him, Casey always resented her father for leaving. Things don’t get easier when Casey discovers she has inherited his powers. The story of Like Father, Like Daughter is written by Kathryn Calamia, our very own Youtube star Comic Uno! She is collaborating once again with Wayne Brown (Lesbian Zombies from Outer Space), who will be doing the artwork for the issue. 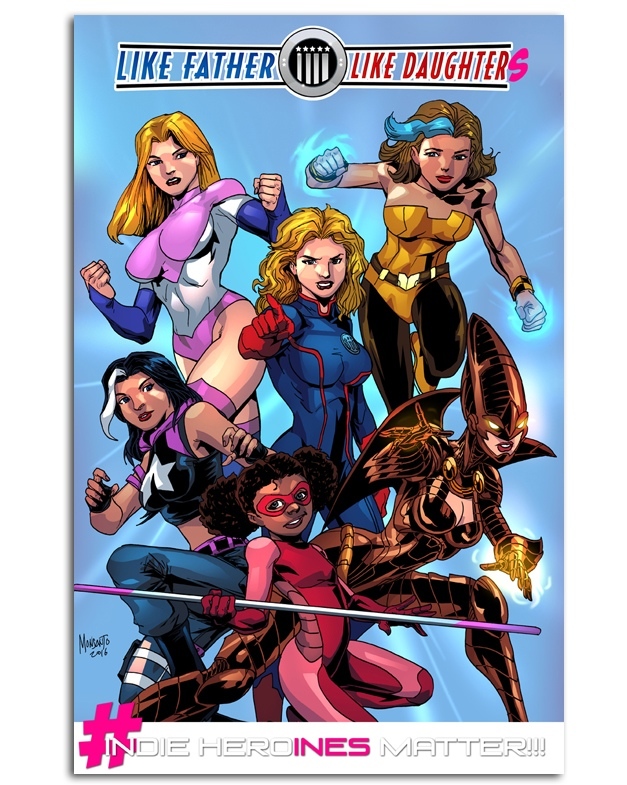 Like Father, Like Daughter was the first comic book series published by Short Fuse Media, who have plenty more series in the works, including Nightwasp. The project will be funded if it hits its goal of $4,500 by March 5, 2017 at 10:00 PM EST. 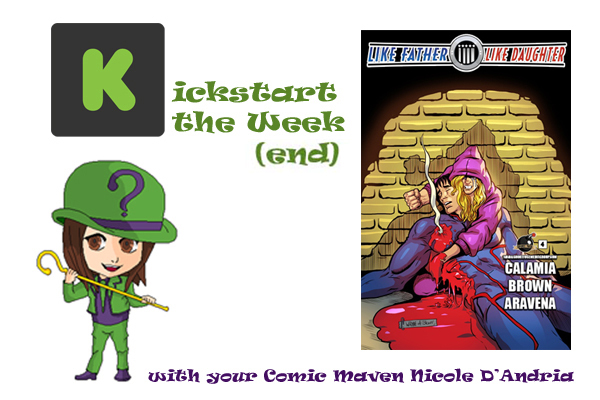 Rewards for backing include a digital ($5) or physical copy ($10) of the issue, every issue of Like Father, Like Daughter so far digitally ($15) or physically with a mini printed prequel companion comic and a pin up ($20), as well as a never before released new comic book from Comic Uno called They Call Her… The Dancer and a live chat with Kathryn herself about her comics ($45). Backers can also enjoy the short “Off-Day” from Nightwasp’s Kickstarter campaign, which features Invulnerable and leads directly into Like Father, Like Daughter #4. Pledge money to the project on the official Kickstarter page. Me: What can you tell us about issue 4 and how it differs from previous issues? Calamia: If you enjoyed the interaction between Casey and Invulnerable in issue 3, I think you’re going to really enjoy where their relationship goes in this upcoming arc. This issue has a big scene between them. Me: Casey definitely has a strained relationship with her father. Disregarding your own comic, what would you say is your favorite father-daughter relationship in comics, as well as the worst example you can think of? Kathryn Calamia: Wow, this is a tough question for me because I really love reading strong father/daughter relationships in comic books, but I would have to choose Barbara Gordon/Jim Gordon and Peter Parker/Mayday Parker. I find Barbara and Jim's relationship very interesting because of how protective he is over his daughter. (I'm using the canon of where Barbara is Jim's daughter because there are stories where Barbara is actually Jim's niece.) Barbara wants to be a cop like her father, but Jim doesn't want that life for his daughter. That's where we see Barbara create her superhero persona as Batgirl. Their dynamic becomes even more interesting after Babs becomes Batgirl because you question if Jim knows his daughter is a superhero. Another father/daughter dynamic I really enjoy is Peter and Mayday Parker's relationship. Peter is a retired superhero in the Spider-Girl series and when May inherits her father's abilities, she wants to take over his mantle. 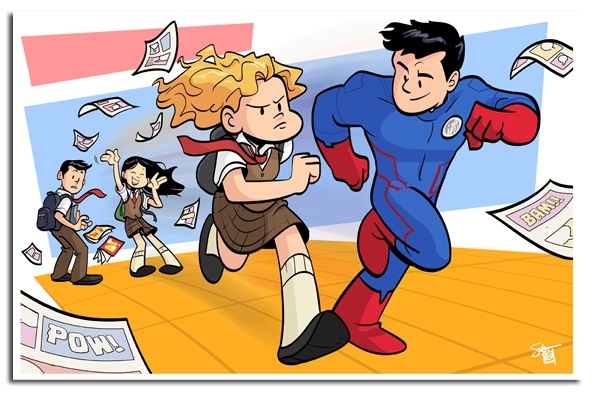 Just like Jim, Peter is very protective over May and he doesn't want this life for her, but over the course of the series he becomes supportive of May being Spider-Girl. The worst father/daughter relationship I can think of in comics is probably Rose and Slade Wilson's dynamic. Rose becomes a better person when she starts distancing herself from her father. Me: As a comic book reviewer, how do you balance working in the comic book industry as well as reviewing other creator’s books? Calamia: It's an interesting balance. As being someone who is working in the comic book industry I understand the process of actually creating a comic book. So, it’s given me even more appreciation for the comic books I'm reviewing. Me: One of the rewards people can get from pledging is “They Call Her…The Dancer”. Can you tell us a bit more about this? Calamia: This is a very exciting thing for me! 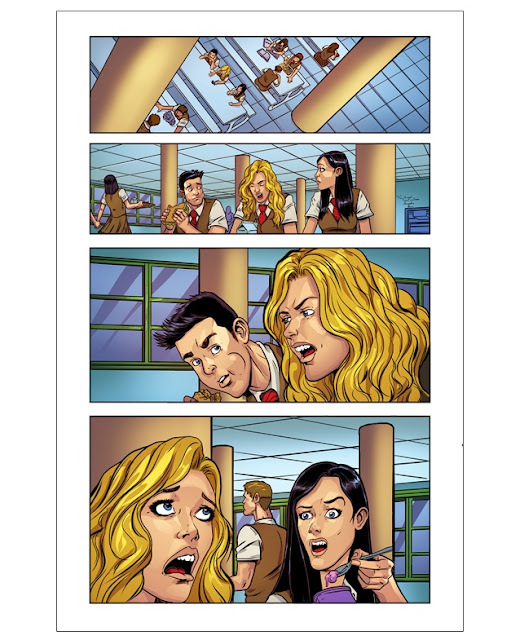 I'm really glad that our backers will have the chance to read the first issue of this comic book. I've been working on this mini-series for awhile, and it's very different from Like Father, Like Daughter. It's a gritty and psychologically driven assassin story that focuses on the art of dance and martial arts. 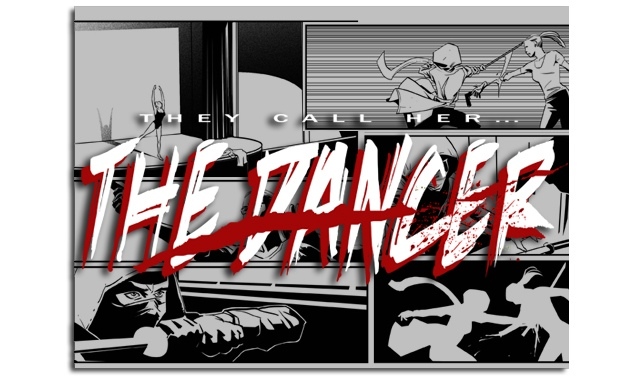 "Make 100" Exclusive Comic Debut of "They Call Her...The Dancer"
Me: What do you think is the number one reason people should pledge money to Like Father, Like Daughter? Calamia: I hope that people support the Kickstarter so we can continue Casey and Invulnerable's story. I have big plans for these characters that I hope our audience will enjoy. Me: Can you give us a glimpse into the future of Like Father, Like Daughter in regards to your plans for the next story arc? Calamia: The future of this story arc is going to up the action a lot! These first four issues are about building the characters and the situation their going to be going up against. The twists and turns start in issue 4 and continue through the end of our arc. Me: This is your first comic book series that you've written—what about the process surprised you? Do you have any tips for other first-timers in the comic book writing biz? 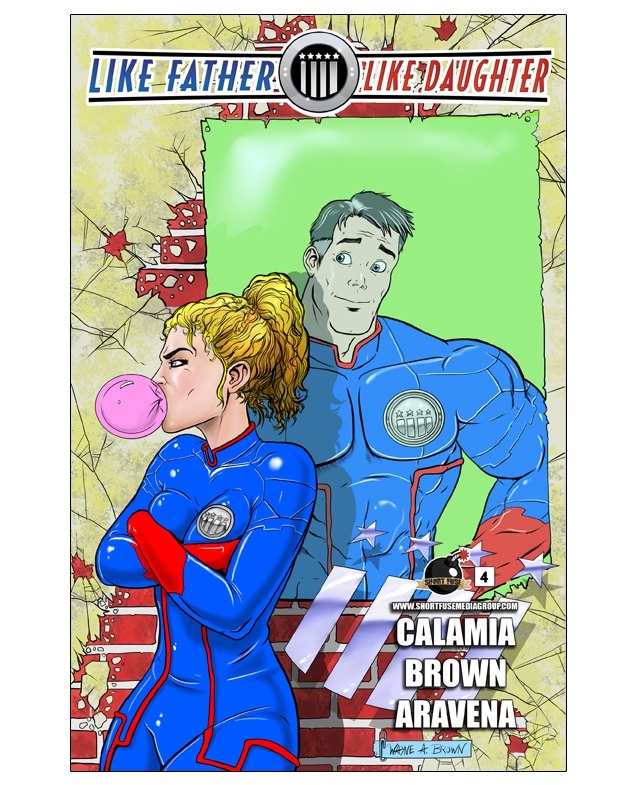 Calamia: The whole process of creating a comic book has been amazing and educational. I've learned so much about the comic book industry through Like Father, Like Daughter, and I can't wait to experience even more on the publishing side of things. And as for tips? I say if you want to write comics, keep writing. I also feel it's important to be active on social media, to learn about all the different sides of the comic book industry. Me: What issue of Like Father, Like Daughter has been your favorite to work on so far and why? Wayne Brown: Oh tough, I’ve had so much fun with each issue. 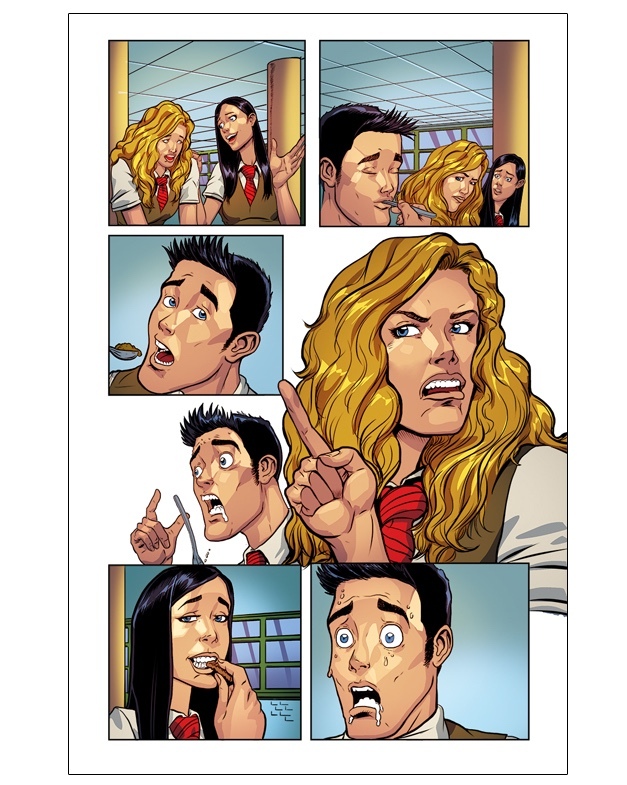 But I have to say the latest issue was my favorite, the characters really are starting to come alive for me. After all the repeated drawings of the characters, and getting their personalities in my head, I can now draw each character easily and with the kinda flare they deserve. 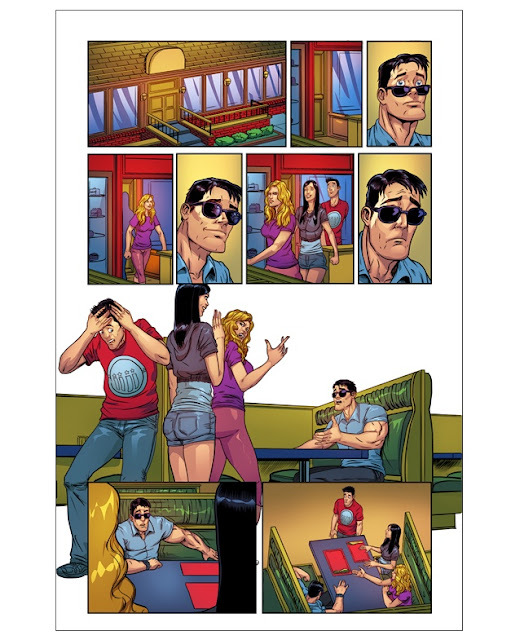 Also the story has some new depth with Casey and her dad; it’s fun and serious. This issue is really a break away from what we’ve seen so far, and I think our best. I just hope we can keep the trend going into future issues because there is really something here building on this title that I would put up against DC and Marvel Books. I think this issue will surprise people and really start pulling them into the series. Me: Who is your favorite character in the series to draw and why? Brown: Lol, wow, ummm. That’s really tough. The school mascot! Because he’s so awesome! They’re all so good, I like... hummm. I guess I have to say Wes, he’s such a cool geek boy, it hits home. 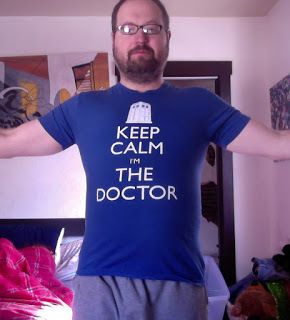 He’s like my sons and some of me as a kid, we share a love of sci-fi. He really has a lot that guys can identify with and he’s a cool character, in my opinion. Me: How has your experience on this title been different than your other work? Brown: Well, my other work has been mostly comedy/horror and indie; here is where I get to play with mainstream superhero comic action work. I love it, it’s what I wanted to do for a long time. Kat’s stories in Like Father, Like Daughter remind me of the (Chris Claremont and John Byrne) X-Men comics I loved as a kid. My favorite stories were about the characters that did more than just fight bad guys; they lived lives and the conflict of the two was always more interesting. I still remember my favorite issue, Uncanny X-Men #183, with John Romita Jr., where Colossus had a bar fight with Juggernaut. When I draw Like Father like Daughter, it captures the nostalgic feeling of reading those books, and it really motivates me to bring out my best. This is my favorite title to draw right now, because of that, it's like being (Cough, Cough) again. Me: Of the superhero comics at DC and Marvel right now, if you could only choose one to draw for, which title would you pick to illustrate and why? Me: I know you offered some artistic advice in our last interview, but do you have any additional tips you'd like to add? Brown: Love doing it, even when you hate doing it. Relationships all have love and hate in them so if you just love to draw, that’s great, but you’ve got to face the hate you’ll have sometimes for drawing and the hate for yourself for loving to draw even when you hate it! Because when you have a relationship, not a fantasy, it means you’ve committed to it and it takes nothing less than that if you want to do it forever. Me: Thanks for your time, Kat and Wayne! Best of luck with your Kickstarter. If you’re interested in helping them out and backing Like Father, Like Daughter #4, check out the official Kickstarter.